Once you have cast on your first stitches, you will be ready to begin your first knit stitch row. There are different styles of knitting, the most common of which are Continental and English style knitting. Both styles of knitting give you the same knitted piece at the end, but they differ in how you hold your yarn. The “knit” side of a pattern. Do you see the little “V”s on this smooth side of the work? Here, you’ll learn how to knit in the Continental style. I like Continental style knitting because it is quicker to make the knit stitch once you have practiced some. It is also, in my opinion, easier to maintain the tension in your yarn for even stitches when you knit in the Continental style. Below, you will find my written steps to learn the knit stitch as well as a video tutorial. Hold the yarn coming from your yarn ball behind your needles. I like to make a loop or two around my left pointer finger to maintain tension. 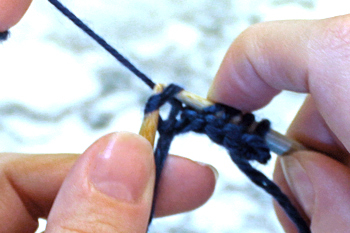 Insert your empty needle (right hand needle) into the front loop (see picture) of your first cast on stitch from front to back. Here, I have already made four knit stitches. The remaining un-knit cast-on stitches are under my left thumb. 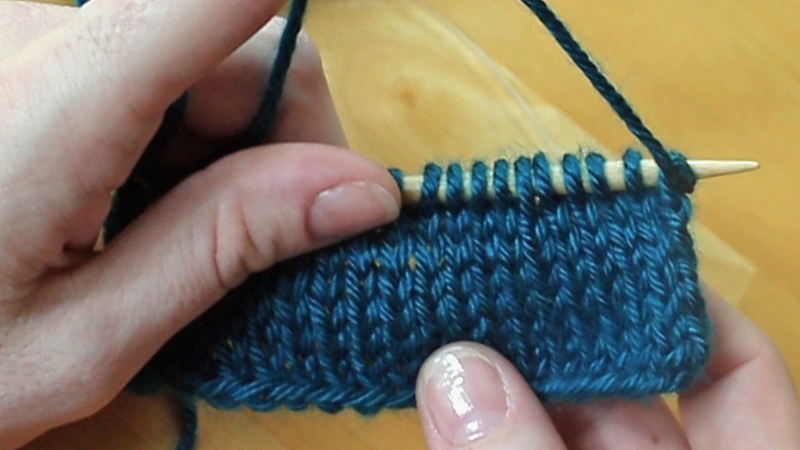 Look closely at how to insert your needle into a stitch to knit. Pull yarn from your yarn ball with the empty needle (right hand needle) through the first cast on stitch. You have made your first knit stitch! Turn your work to place your first knit row in your left hand. Continue making the knit stitch until the end of the row. Repeat. This pattern is known as the Garter stitch. If you are following my Free Beginner Knit Scarf Pattern, all you need to do is continue with the knit stitch until you’ve made a rectangle long enough to fit you as a scarf. This will help you practice your knit stitch and work on maintaining an even tension. When you are happy with the length of your scarf, learn to bind off and weave in your ends. Now that you know how to make a knit stitch, you will want to practice to try to make all of your stitches the same. This is called “maintaining knitting tension.” Learn more about holding your yarn and knitting tension here. Glad this was helpful to you, Collin! Thanks! Glad you both like my page. 🙂 Right now, I’m still writing the material for this site myself, but if I start looking for guest writers, I’ll be sure to let you know! Glad you stopped by.